For the multitudes of Jesus' followers and even His disciples, the road to understanding who He really was, was long and bumpy. He acted like the political deliverer they were expecting—healed people, fed people, was full of wonderful wisdom. But He was from Galilee. They knew His mother (knowledge which included His questionable beginnings) and His family. He was so human. How could He be Messiah? Then He began doing disturbing things like claiming He was the fulfillment of prophecy (Luke 4:16-19; Isaiah 61:1,2) and supplementing His healings by telling people their sins were forgiven (Mark 2:5,9,10; Luke 7:48; John 8:11). How did he get from the confused state the disciples appeared to still be in at the time of Jesus' ascension (Acts 1:6), to this bedrock assurance? Was it years of study? A semester at seminary? Weeks of retreat and seclusion? No. I would submit it all came clear on the day the Spirit fell in the disciples in the Jerusalem upper room—the Day of Pentecost. The stories of the disciples' actions and preaching from that day forward have an entirely different tone about them than the ones that precede that day. From Pentecost on there is a clarity, boldness, passion, and fearlessness they never had before. I believe the Holy Spirit came with a supernatural download of insight. He put it all together. I believe we need the same thing. 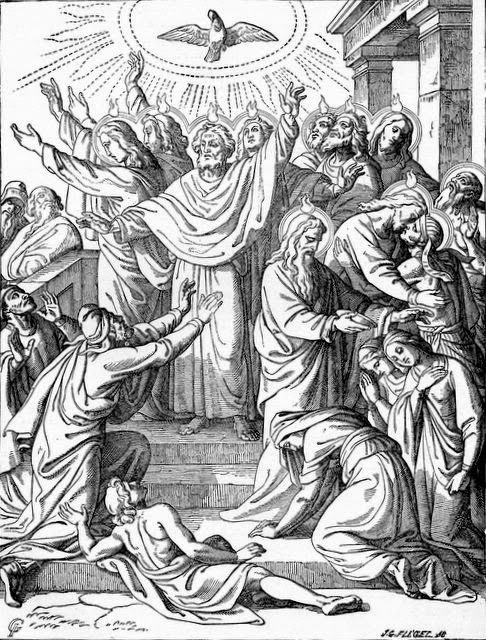 Unless we have the Holy Spirit's enlightenment, what we know of Jesus—both intellectually and in experience—will have that same tentative, questioning, fearful aura of the disciples' pre-Pentecost witness. They did have the Spirit (John 20:22) but not in the same measure as they had Him (or perhaps better said, He had them) after Pentecost. May we invite Him to fill our lives with the same insight, clarity, and power of witness that Peter demonstrates here. PRAYER: Dear Holy Spirit, please fill my life with Your presence and power. Give me insight and clarity about who Jesus is.